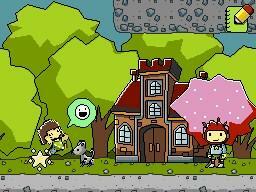 Scribblenauts is the type of game I should be head over heels for. The game is a testament of what can be done with video games, definitively proving that not everything has been done before. Better still, the game oozes with personality, has an infinite amount of replay and can be enjoyed by just about everybody. This is the type of game that I usually champion. So why is it that I love the concept so much, but just can't get into the game? The gameplay is fueled by an intoxicating idea: Whatever you can spell can be created and used to solve puzzles. That's no joke, thanks to the game's 10,000 word dictionary; you can create whatever you want. UFOs, tigers, vampires, zombies, boulders, submarines, God ... whatever. Need to reach a star on the top of a house? Simply use a jet pack (or wings, a helicopter, ladder, or ...). If you need to reach a star in the water you can use a scuba suit. Need to get a star out of a tight spot? Tie it to a cat and then create a mouse for it to chase. The puzzle solutions are nearly limitless, you can solve each of them in dozens (if not hundreds) of extremely creative ways. Your typical puzzle level will give you a hint and then expect you to figure it out. To create you have to pull up the game's keyboard, type out a word and like magic that item appears on the screen. You can move the object around, make it interact with your character and even tie it to other objects. You are limited by how many different objects you can create at any one time, and like golf the object is to have the lowest score possible. The game certainly gives you enough room to experiment, so I never felt like I was being boxed in with too few objects. 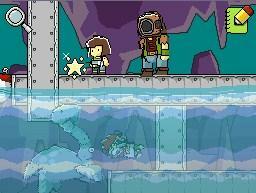 Scribblenauts has two completely different game modes to play around in. The first is the aforementioned puzzle mode. 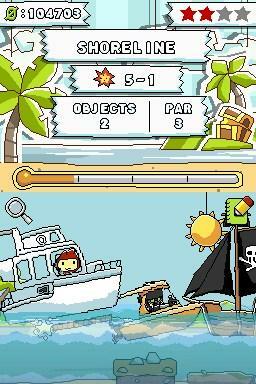 The other is the action mode, which places a star in the level and has you try and figure out how to retrieve it. The trick to these levels is that you will often have to traverse tough terrain and tricky obstacles in order to collect the star. 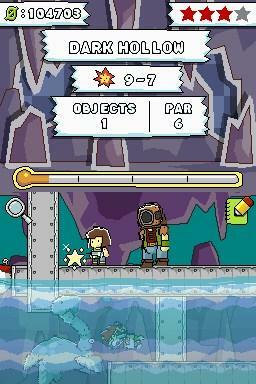 Unfortunately these levels are nowhere near as exciting as the puzzle mode. Part of the problem is that too many of the levels can be accomplished using the same few words over and over. I also found that there wasn't much room for creativity in these levels, something that immediately turned me off of these tiresome levels. While I wouldn't call the action levels bad, they come off as unnecessary filler when compared to the superior puzzle mode. These two modes provide a staggering amount of levels, more than 200 different puzzles for you to solve. And if that wasn't enough, you'll also find a level editor which gives you the ability to test out your craziest ideas and try and trick your friends. Before even attempting to beat the hundreds of puzzle and action levels, I found myself hooked on the freedom offered to me in the level editor. It's here, without any of the shackles associated with the actual puzzle modes, that I had the most fun. It was in this mode where I could be my most creative; it gave me free reign to literally try anything and everything I could think of, often without limits. I can see gamers getting hooked on the freedom given to them in this mode, so much so that it makes the rest of the game feel a little too controlled. If only there was a way to combine this freedom with the structure of the action/puzzle modes we would really be on to something amazing. No matter how good the concept is, innovation cannot make up for bad gameplay. 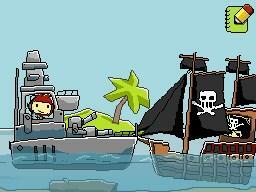 Right from the get-go you'll discover the game's biggest flaw - it relies too heavily on the touch screen. This is one of those games that has you doing just about everything with the stylus, from starting the levels to creating items to moving your character. This means that once you've created (and dropped) a few items, you will need to click and drag your character all around the level. Sometimes this works, such as when you are only dealing with large objects and performing uncomplicated moves. However, too often you'll discover that it's far too easy to select the wrong thing, tell your character to go to the wrong place and ultimately mess up your entire plan. This ranges from being annoying to downright infuriating. Things go from bad to worse when you create one of the many vehicles your character can use. 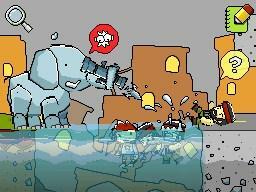 I'm sure piloting a helicopter in real life is no easy task, but doing it in Scribblenauts is next to impossible. It's far too easy to accidentally click on the vehicle and eject yourself at the wrong time. And don't even get me started on all of the times my vehicle flipped over or glitched out. It's enough to make you not want to use some of the game's words, but you'll need to in order to actually beat the game. Had the developers had the foresight to simply move the character's control to the D-pad none of this would have been an issue, however, that's not what they did and gamers are now forced to deal with one of the worst control set-ups of the year. Aside from the disastrous controls, the game has a unique style that works well on the underpowered Nintendo DS. 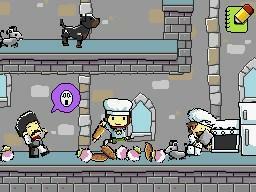 Scribblenauts look combines the cartoony look of cel-shaded graphics with the 2D plain, giving gamers a flat (albeit artistic) look. You will never be blown away with how the game looks, but it's never about the visual fidelity. Instead you are excited by the little things, like what a particular object may look like or how one similar item my compare to another. Even if this game was on a more powerful console, I would hope that the artistic style would be retained. Unfortunately, I spent a lot of my time wanting the game to be on a different system. As I sat there constantly dying because of the poor control scheme, I wondered if I might have a better time on a larger screen. Even if they didn't change a thing for a PC port, the larger screen and more precise mouse controls would do this game a lot of good. 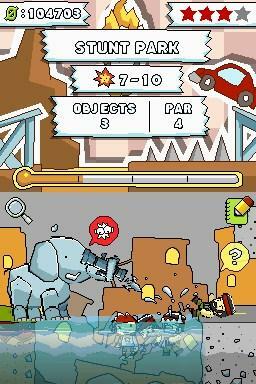 Simply put, the game is held back by the limitations of the Nintendo DS touch screen. 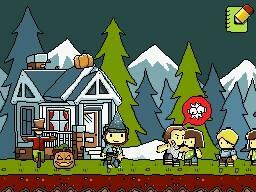 If you can get past the annoying control scheme, you'll find that Scribblenauts offers an amazing concept that almost matches its potential. This installment feels more like an experiment; a proof of concept, if you will. With a little more structure and a better control scheme this could be one of the very best games around. Hopefully the game will sell enough to warrant a second game that fixes all of these problems, because THAT would be a great game to own. This, on the other hand, is a fun game that ultimately misses its mark. 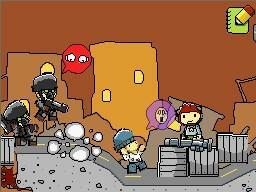 The freedom offered to you in Scribblenauts is both intoxicating and overwhelming. 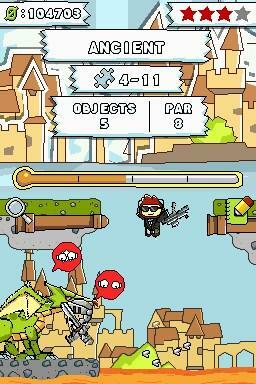 Never before has a game given you this much control over solving the 200+ puzzles. Unfortunately it's a nasty control scheme that ultimately brings it back down to Earth. 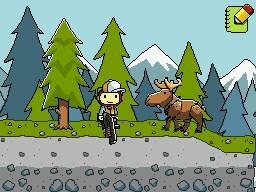 With some tweaking and structure Scribblenauts could have been one of the best games of the year. As it is, it's merely adequate.